My first fine dining experience happened when I was an ignorant 20-year-old. I had managed to save enough cash from my job as a server in my dorm’s dining hall to take my girlfriend (known from that year on as She Who Was Crazy) out for a fancy dinner. After some research I settled on L’Espalier, which was (and still is) recognized as one of Boston’s best restaurants. I was sure he was screwing with me, but under his (and SWWC’s) expectant gaze, I tried one. He was right, they tasted of orange. I found myself wishing I still had a bit of the chocolate to accompany the buds. I remember nothing else about that meal, but I have always been able to recall the taste of those flowers. 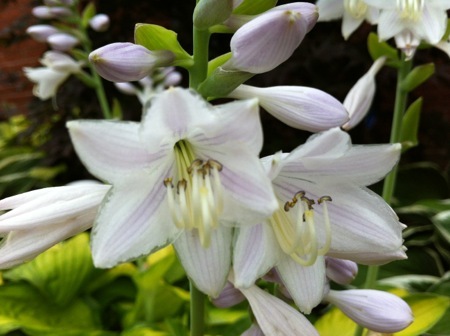 As I looked at a yard full of flowering hostas, I was once again reminded of a decades-old dessert. I pinched off a just-opened bud and ate it. Sure enough, I could taste a faint orange note underneath the vegetal crunch. I had a yard full of garnishes, but a narrow window to use them before the blooms dropped off. 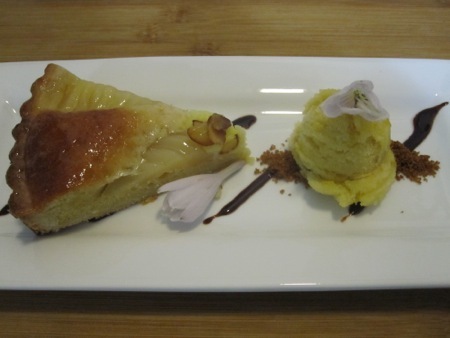 The taste of the flower was almost overwhelmed by the tart sorbet, but was clearly detectable when eaten with the tart. I’ll have to come up with a few more flavor combinations that would work with this garnish. If you have hostas, I recommend that you give the buds a try. I promise I’m not screwing with you. when you wrote the article about building a drying cabinet you talked about wiring an external temperature unit and a humidifier and fan into a hydrostat. Is it possible to give me a brief overview of how you wired this units in especially the external temperature unit. There is no actual “wiring” in the sense of making any electrical modification to the existing wiring of the fridge. The hygrostat has a plug in the back that provides its power. It would usually be plugged directly into wall current, but all I did was run an extension cord from an outlet into the fridge, passing it through the gap formed when the door is opened (the gasket seals around the cord when the door is closed). The front of the hygrostat has three additional outlets. I plugged the humidifier into one, and a small fan into the other. When the humidity drops below the set point, the humidifier and fan power up, distributing moisture inside the fridge. The temperature controller operates in a similar fashion. It is plugged into wall current and sits outside of the fridge. The fridge power cord is plugged into the controller. The thermocouple for the controller is routed into the fridge like the power cord for the hygrostat: passed through the door gap. When the temperature of the fridge rises above the controller set point, power is activated to the fridge. It helps to remember that temperature and humidity control in this setup are independent processes. The humidifier could be running while the fridge is powered down (at temperature), of the fridge could be running while the humidifier is powered down (at humidity). I hope that clears thing up for you.